January 29 is Emanuel Swedenborg’s birthday (or is it? ), and we thought we’d celebrate by taking a closer look at one of his favorite places: his garden. In 1743, Swedenborg bought some property on Hornsgatan street in the Södermalm district of Stockholm in his native Sweden. The time period was a significant one for him personally: during the two years that followed, as he traveled through Europe, he went through a spiritual crisis that led to an inner awakening. By the time he returned home to Sweden and moved into his new property in 1745, he had begun what biographers often call his theological phase: he began recording his spiritual experiences and composing books based on his new understanding. The bulk of the property was taken up by Swedenborg’s garden. At the west end, farthest from the main house, was a small summer house where Swedenborg went to write. Swedenborg’s garden is both a powerful metaphor and solid ground. Most eighteenth-century gardens kept by scientists were used for study and experimentation. Swedenborg certainly studied and admired the plants in his garden, but his garden also blossomed with many other uses. He walked in it for the sheer pleasure of communion with nature, taking visitors along with him. He wrote theology in the garden, in a summer house situated at the west end of his property facing the garden, and he also worked the garden itself. One might expect an eighteenth-century aristocrat to delegate gardening to servants, but Swedenborg seems to have relished the physical labor and contact with the plants and earth, and he was happy to share the harvest. He was a generous landlord, allowing his gardener’s family to profit from the fruits of the garden. . . . He shared the garden with visitors and children, building fanciful structures, such as mazes and mirrored gardens, to appeal to the imagination of the young, or the young at heart. He meditated in and on his garden, visiting it at various times of the day. . . .
Swedenborg’s modest garden plot of just over an acre held plants from all over the world, and a variety of structures, pathways and beds. In addition to vegetables, fruit trees, poplar and cypress, there were arrays of flowers: tulips, hyacinths, carnations, sweet peas, larkspur, violets, scabiosa, sweet william, Canterbury bells, catmint, chalcedonica, spurrey, lilies, sunflowers, and roses of many varieties. There were stone paths and a tall enclosing fence, an ornate gate and an orchard, a kitchen garden, bird house, summer house, garden house, library, maze and a mirror creating the illusion of a double garden. The garden was laid out along formal lines, but with eccentricities and flourishes, all nicely reflecting Swedenborg’s own mind—open but protected, useful and abundant with life. After Swedenborg’s passing, his property passed to his heirs and gradually changed over the years with successive owners. 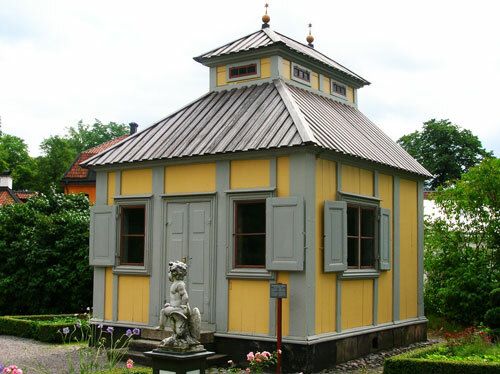 In 1896, the original summer house was moved to the Skansen Museum, where it can still be seen today. You can also find more information about the summer house (with more photos) at the New Church History site. For more on Swedenborg’s property, including a sketch of what it would originally have looked like, see this article from the journal The New Philosophy.